I woke up bright and early to hike some waterfalls. 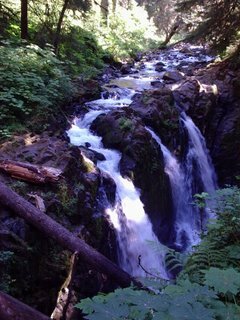 I started with Marymere Falls here near Lake Crescent. Friends, Don and Gwen from Kernville, CA, had been here just a few weeks ago. I then headed to the Sol Duc Hot Springs area. I had never visited this part of the Olympic National Park before and I was curious to see the Hot Springs and there was supposed to be a spectacular waterfall. I suppose I knew in the back of my mind that this was a very popular destination. At one time, Sol Duc Hot Springs was one of the most elaborate health resorts in the country. A half-million dollars was spent constructing the spa, which featured a four-story, 165-room hotel that opened in 1912. In 1916, the roof of the main building caught fire. Strong winds scattered the sparks and within hours the resort burned to the ground. Today's resort is a small operation in comparison. Legend has it that the hot springs are the tears of dragons! Two dragons had a duel over a boundary dispute and it ended in a draw. They crawled back to their caves and cried tears of mortification. I was not prepared for the crowds of people who were at the Hot Springs at 10 am on a TUESDAY! I can only imagine how it is during the weekends! The two huge tour buses in the trailhead parking lot should have clued me in. As well as the long line for the ladies pit toilet at the beginning of the hike. It was a traffic jam on the bridge over the waterfall. This trailhead is also a jumping off point for backpacking trips into the interior of the Olympic National Park, so you had Japanese Tourists rubbing shoulders with stinky backpackers just back from 7 days in the woods. It was something else! I had originally planned to camp at the campground at Sol Duc, but the crowds scared me away and I decided to drive on out to the coast to find somewhere a little less hectic. 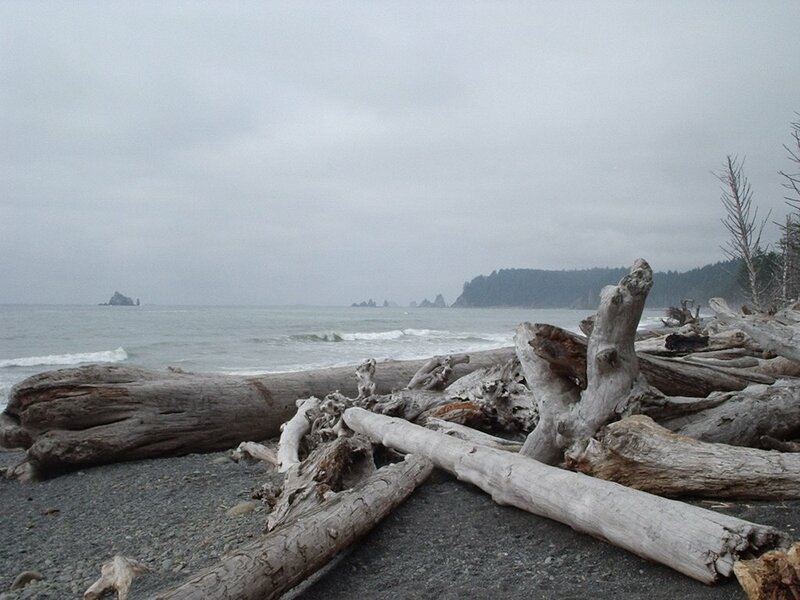 When I got out to the beach, it was dreary and cloudy on this side of the Peninsula. But that did not stop me from hiking out to Hole in the Wall. It is about a 3 mile hike round trip and I had timed it perfectly. The tide was low enough to allow plenty of beach to walk on. When I got back to the trailhead, I had to climb over the huge driftwood logs that line the beach. 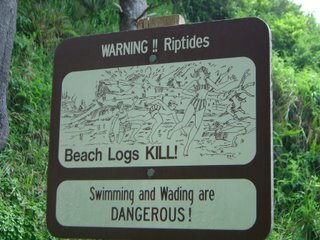 There are always signs warning that “Driftwood Logs Can Kill!” And I always thought that this was highly amusing. Until now! I stepped on a log and it shifted underneath my feet and I fell. I hit my head and thank goodness I did not knock myself out! But I was pretty banged up, and I was definitely going to have a black eye. I decided to call it a day. I went to a new campground that I had never been to before. The Klahowya Campground was very nice along the Sol Duc River and Snider Creek. 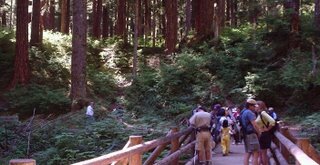 There was hardly anyone there which was nice after the crowds at Sol Duc Hot Springs. I spent most of the evening with ice on my face hoping that I wouldn’t look too horrible in the morning. Originally, I was going to spend another night over here, but after my fall, I just wanted to go home. When I woke up on Wednesday morning, I figured that I would start heading back to Seattle. I drove back along Hwy 101 towards Port Angeles. When I got to Port Angeles, Hurricane Ridge seemed to call to me. I had never been up there. Once a long time ago, when my sister, Alisa was here for a visit we tried to drive up there, but there was still snow on the ground then and they required you to have chains to attempt it. We had given up on the idea that time. This was my chance to drive up there. I could even do a short hike up Hurricane Hill for hike-a-thon. It is a lovely drive to the top and very popular, lots of folks up here. And lots of bicyclists! It is about 17 miles up from Port Angeles and pretty much a 7 percent grade the whole way. I enjoyed the views from the top and then made my way back down towards Seattle. I had a decision to make. Should I take the ferry back to Edmonds, or drive further south along the Kitsap Peninsula and take the ferry directly back to West Seattle? Well, if I went to Edmonds I would be in 5 o’clock traffic through downtown Seattle. Nope, not going to do THAT! So a direct hop to West Seattle looked like the best thing to do. 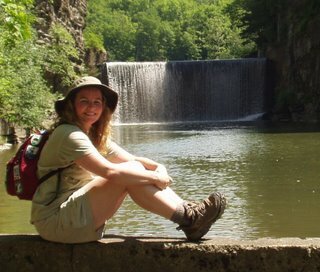 I hiked 6 miles on Tuesday and 3 miles on Wednesday to bring my hike-a-thon total to 40 miles! I hope to get in about 5 more miles before the end of the month. On Monday, I got back to Seattle from working the redeye. I was lucky to get a passenger seat and not the jumpseat, so I was able to sleep for 5 hours on the flight back to Seattle. So I was ready to get in the car and drive over to the Olympic Peninsula for some camping and hiking. First thing was to take the Ferry over. There are about a half a dozen ways to get to the Olympic Peninsula from Seattle. You can drive around the south and not get on a ferry at all. And what fun would that be?? You can take the ferry from West Seattle, you can take the ferries from downtown Seattle to Bainbridge Island or Bremerton. 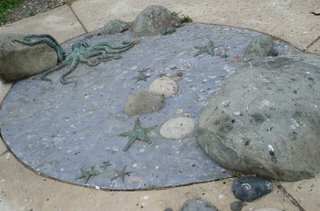 You can take two ferries, one from Everett to Whidbey Island and another from Whidbey Island to Port Townsend. Or you can do what I did and take the Edmonds ferry to Kingston. I had never taken that particular ferry before, so it was a new experience! And I am still not on the Olympic Peninsula. I am only on the Kitsap Peninsula. I still have to cross the Hood Canal floating bridge. But first stop for me once over on the other side was Port Gamble. I had never been through the town of Port Gamble and it is just too cute. The town is a National Historic Landmark with picturesque, turn-of-the-century buildings filled with antiques, an historic church, and New England style homes on tree-lined streets. There was a little tearoom and a used bookstore! I stopped for a quick bite to eat from a Clam and Oyster vendor on the town square! 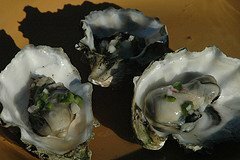 Yummy steamed oysters! Onward to the Olympic Peninsula, I sped through the towns of Sequim and Port Angeles on my way to Lake Crescent. I adore Lake Crescent. It is such a gorgeous lake. It is fjord-like with mountains rising up around it and the color of the water is deep, deep royal blue. It looks bottomless. And was thought to be bottomless by the local indians. The Klallams would never cross it by canoe. They believed that there were evil spirits that would drown anyone who tried to fish there. It actually is more than 600 feet deep at its deepest point. I had come here to hike the Spruce Railroad Trail. It winds around the north shore of the lake. It was originally a railroad that was built during WWI to haul wood to Port Angeles build airplanes for the war effort. Ironically, the railroad tracks were finished after Armistice Day and nothing was shipped on it during the war. 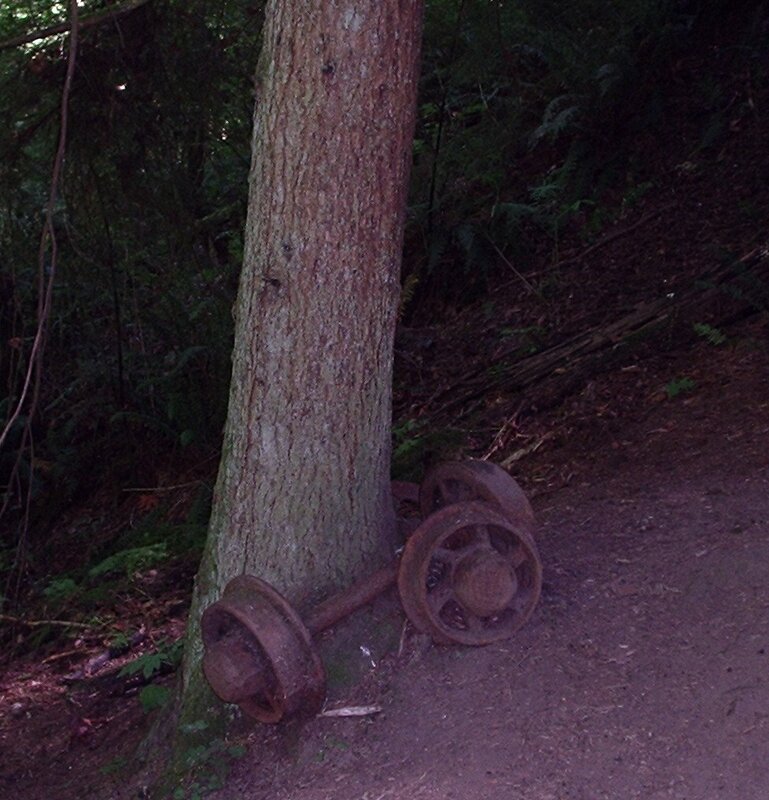 It was used for commercial logging until the 1950’s and the Park Service created a trail out of it in 1981. There are two tunnels along the trail, but they are collapsed and you can’t walk through them. I only hiked out to just past the first tunnel. It was getting late and the lake can seem kind of spooky. There is a ghost story associated with the lake. 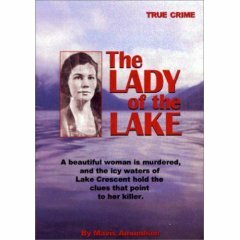 “Lady of the Lake” is about a woman who was murdered in 1937. Her body had turned to soap! The lake is fed continuously by the Olympic Mountains snowmelt. When you're six hundred feet down in frigid water, you don't rot. You're preserved and saponification sets in. She was down there for three years at 38 degrees Fahrenheit and after the cold stopped the decay, salts in her system changed all her fatty tissues little by little, and she turned to soap. The depths of Lake Crescent contain a unique mixture of calcium and alkili that cause this saponification to take place. Investigators were able to identify this woman as the missing Hallie Illingsworth and eventually her estranged husband was extradited from California and in a sensational trial was convicted of her murder. 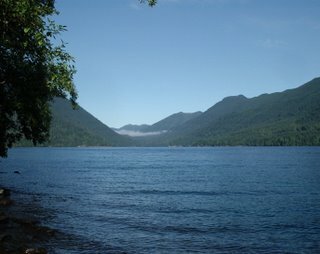 I camped Monday Night at the Fairholm Campground by Lake Crescent. Previously I hiked two miles in Seattle on my layover and on Monday, I had hiked 4 miles for a total of 31 miles for hike-a-thon! A monument marks the spot where the first white settlers landed here at Alki in the winter of 1851. They soon left and built their city across Elliott Bay on the less exposed shores of Seattle’s current waterfront. I hiked 4 miles on Alki and then another mile at Lincoln Park. This brings my total for the hike-a-thon up to 25 miles. The other day, I drove out to Cougar Mountain to hike the Coal Creek Trail. 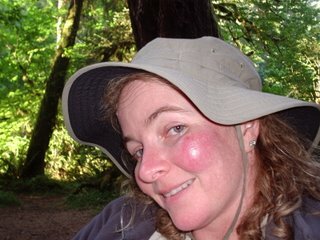 I really enjoy hiking at Cougar Mountain. I hiked this trail last year for hike-a-thon. One of the reasons that I like the Red Town Trailhead so much is the history. 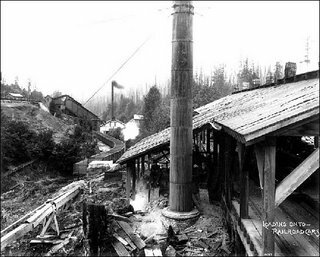 The Cougar Mountain area: Newcastle and Red Town, was once a thriving coal mining operation. Millions of tons of coal from this area was sent by railroad to Seattle and used for energy. It was also shipped from Seattle to San Francisco. The town had a telegraph office and daily mail service, two churches, a hotel, and a general store. 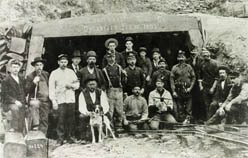 The coal mines were so important to this area that when President Rutherford B. Hayes visited the Seattle area in October of 1880, he made speeches at Newcastle. Today there is not much left to see of this ghost town. Because it was a company town, when they were through mining, they packed up and took everything with them. Any homes or buildings that remained were then scavenged during the Great Depression. The Coal Creek Trail follows the rail line that carted the coal to Seattle. 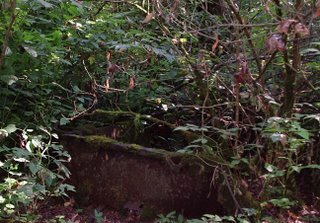 There is a concrete foundation from the boiler of the hotel at the beginning of the hike. You can see an old mine shaft and by the waterfall is the site of the old locomotive turntable. Odd little hills and hummocks are the remains of the debris piles that were left from the mining operation. One of my favorite remnants of the coal mining era is down the Primrose trail. There is a coal car wheel attached to a tree. 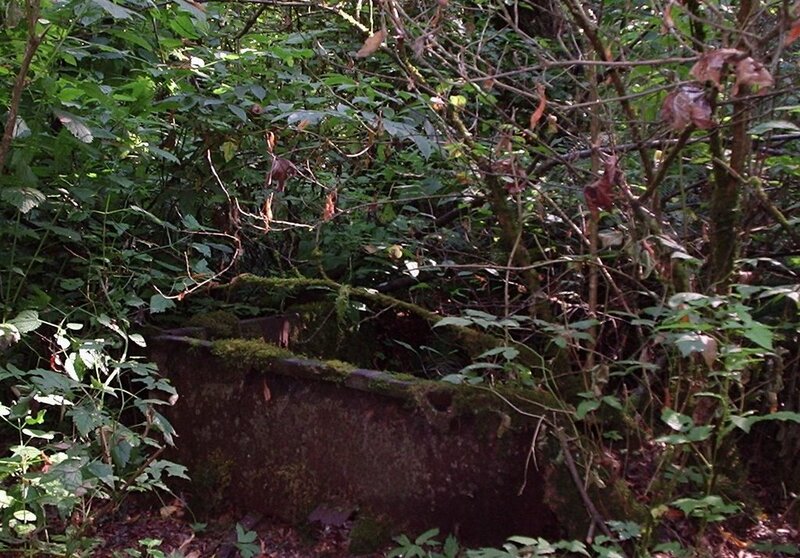 And what might be the rusted shell of a coal car near the junction of the Primrose Trail and the Coal Creek Trail. I hiked the Coal Creek and Primrose Trails for 4 miles. This brings my total mileage for hike-a-thon to 20 miles. And I am only $20 away from having $1000 in pledge money!! Thanks so much to everyone who has been supporting me during the hike-a-thon. 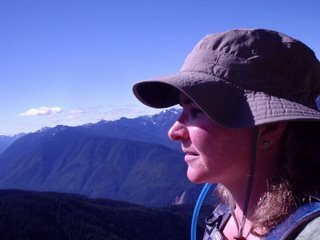 Well, they aren’t really huge mountains, but I hiked both of them this week: Little Mount Si and Mount Peak. Little Mount Si is the little brother of Mount Si. Mount Si is an 8 mile hike straight up, Little Mount Si is a 5 mile hike that meanders through the forest and goes up to a nice little bald (elevation 1576) with views of I-90. Real hikers snub their noses at Little Mount Si, but it is just right for my hiking abilities. Mount Si and Little Mount Si were formed millions of years ago by an upthrust along a fault line. The Mountains got their name from an early settler named Josiah (Uncle Si) Merritt. He lived at the western base of the mountains near the site of present day North Bend, WA. Supposedly Mount Si was never logged, but in 1910 a fire engulfed the whole mountain. The growth on the mountain today is a result of that burn in the early 1900’s. When I got to the parking lot at Little Mount Si yesterday morning, it was already full. There were only 2 spots left and I took one of them. There were two vans, which should have warned me that the trail would be crowded with kids! I have never seen the trail so busy and especially on a week day! But it was a gorgeous sunny day in Seattle with highs in the 70’s and everyone was taking advantage of the weather. Today, the weather was still cool, but cloudy. I drove down to Enumclaw to tackle Mount Peak. I have always known this little mountain as Mount Peak, but it has a bunch of different names. Mount Pete and Pinnacle Peak are two of them. It is also the site of the Cal Magnusson Trail. Supposedly the mountain was called Mount Pete, for a Yugoslav named Pete Chorak who emigrated to Enumclaw, WA in 1911 and donated the land for the park. The trail to the top was named for Cal Magnusson, a local Boeing Employee, who had hiked and maintained the trail for the past several decades. I don’t know why it is called Mount Peak or Pinnacle Peak! Mount Peak is a volcanic knob that was encased by the later deposits of the Osceola Mudflow. The Osceola Mudflow was when part of Mount Rainier sloughed off about 5,600 years ago and sent a slurry of rock and glacier into the river valleys. Mount Peak tops out at 1800 feet and used to have a Forest Service Fire Lookout at the top. It is long gone and all that is left is the evidence of the foundations. Unlike Little Mount Si the day before, Mount Peak was practically deserted. There were only two other cars at the trailhead and I passed their owners as they were making their way down the hill. Mount Peak is a 2 mile hike, mostly straight uphill, but it is over quickly! It was cloudy today and there were only peek-a-boo views through the trees along the climb to the top. All my mountain climbing resulted in 7 more miles for the hike-a-thon. For a total of 16 miles! Today I hiked around Tradition Lake near Issaquah, WA. I did 3 1/2 miles for the hike-a-thon for a grand total of 9 miles over all. Also we have hit the $900 dollar mark with pledges. But I don't want anyone to get the idea that it is okay to stop there. $1000 would be really great!! And it is not that far away. Also remember if you haven't already paid me, I need your money by the end of August. Nothing exciting happened on my hike today, so I thought I would talk about the Washington Trails Magazine. 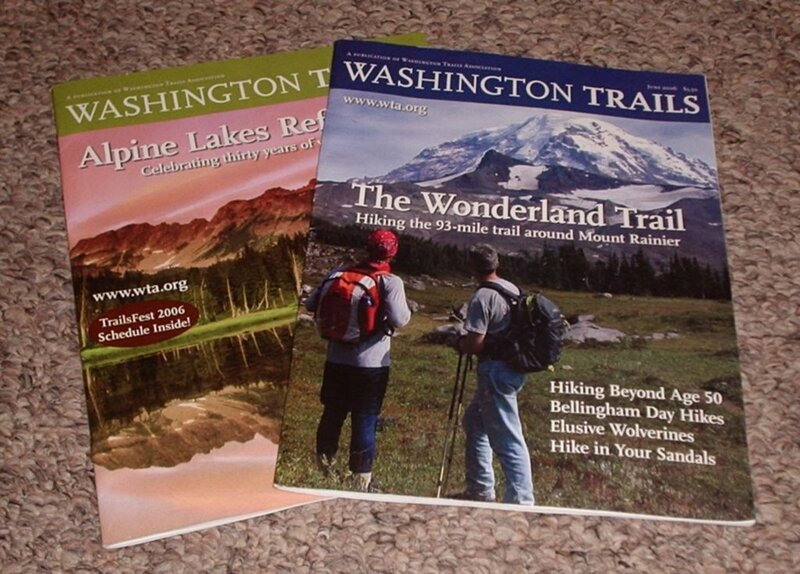 If you pledge at least $35 you get a membership to the WTA and a subscription to the Washington Trails Magazine. This is a great little magazine. 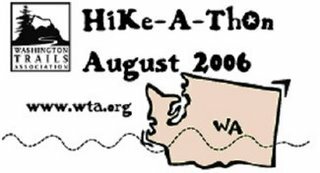 It comes to your home 10 times during the year and it has some great articles about hiking around Washington State, and there are general articles too! Like "Backpacking with Kids" and Gear Reviews. Heck, just the photos alone will make you drool over all the great hiking we have here in the Pacific Northwest! I didn't rack up much mileage today, but I had a wonderful time hiking a couple of miles. As many of you know, I am an avid letterboxer. I have been letterboxing for 5 years and that is how I met my boyfriend, Ryan. Letterboxing is an intriguing hobby combining artistic ability with delightful "treasure-hunts" in beautiful, scenic places. 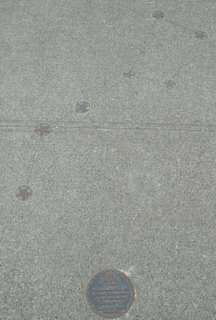 Participants seek out hidden letterboxes by following clues (that are available online), and then record their discovery in their personal journal with the help of a rubber stamp that's part of the letterbox. In addition, letterboxers have their own personal “signature” stamps that they use to stamp into the letterbox's logbook. Today, two letterboxers from New Mexico were arriving into SeaTac Airport and were interested in meeting us to exchange signature stamps. 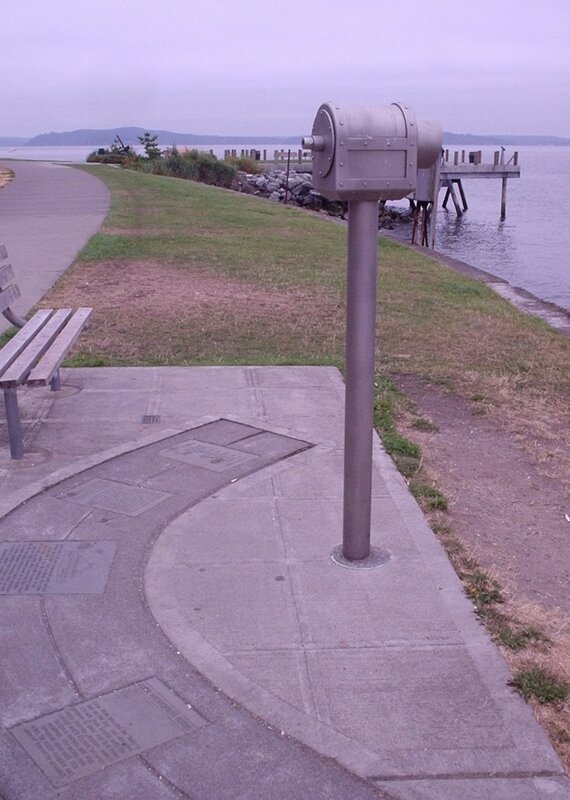 I suggested that we meet at Des Moines Creek Park to hike the trail there and hunt for letterboxes. We met around noon and had a lovely time hiking the trail. 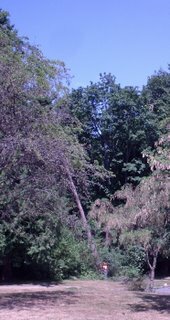 It is a wonderful flat, paved biking and hiking path near SeaTac Airport. The airplanes were taking off over the park today and we got some close-up views of the bellies of several 737’s, DC-9’s and a couple of 747’s! Also the blackberries were out in force. They were everywhere and ripe for picking. After an appetizer of blackberries, we went to the Red Robin at Southcenter Mall for lunch. We had a delightful visit with Lion’s Mane and his friend from New Mexico! I got in 2 miles today for a total of 5 ½ miles overall for the hike-a-thon.